The Eames Select Hang It All is a limited edition design variation on the Eames Hang It All (recently featured) by Herman Miller. This classic interpretation of the Hang It All is available until 15th February 2011 – unless it sells out sooner of course. The colorful hooks and white frame of the original piece have been replaced by solid walnut hooks and a black steel frame. This limited edition essentially offers a change in color to the original design, rather than any changes to the integrity of the original piece. Having said that, the changes made to the Eames original will appeal to those with more adult tastes or people who are looking for a designer item that will blend with a neutral or more traditional design scheme. 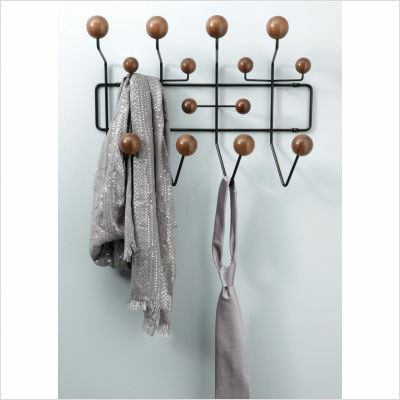 This piece will also serve as a stylish coat or umbrella rack in a commercial setting or an office, where a more serious tone is required. I have to admit my personal preference is for the more colorful original as I believe it adds a touch of playful personality to a space, however I can definitely understand why Herman Miller’s Select edition will be a popular choice. A limited edition designer piece – the perfect Christmas or housewarming gift for a stylish gentleman perhaps? The Eames Select Hang It All is available for a limited period right here!